I wonder at what point in my life I’ll stop having no money. Will that time ever come? I honestly cannot see an end right now. And the thing is I do not spend excessively. I do not. Lunch out once a week, maybe dinner once a week, groceries from Farm Fresh Delivery once a week, the occasional extra trip to the regular grocery to get baking supplies, gas for my car, the occasional trip to Target to buy toilet paper and soap. That is literally all that is on my credit card statement for the past month. Gas. Food. Target. One J.Crew charge, items which were on sale, and one of which I returned. I bought a cardigan thing in June from Anthropologie, but I wear the thing once a week at least. In fact I’m wearing it today. I feel like all my money goes to bills, rent, and paying for the uber-expensive work that was done on my car last month. I also bought a swimsuit last month, which probably wasn’t completely necessary, but if I do ever come upon a chance to wear a swimsuit, it will not be a two-piece. Not anymore. OK, on to happier things. Much happier things. CAKE. CHOCOLATE. BEER. I realize I may have lost your attention as I spilled my money woes, but do I haven it back now? My little brother turned 24 last Wednesday. Yikes, 24. I remember my 24th. It doesn’t seem that long ago, and in reality it wasn’t. Only three years ago. But it was in this Indianapolis-Adam-Jack and Jill lifetime. 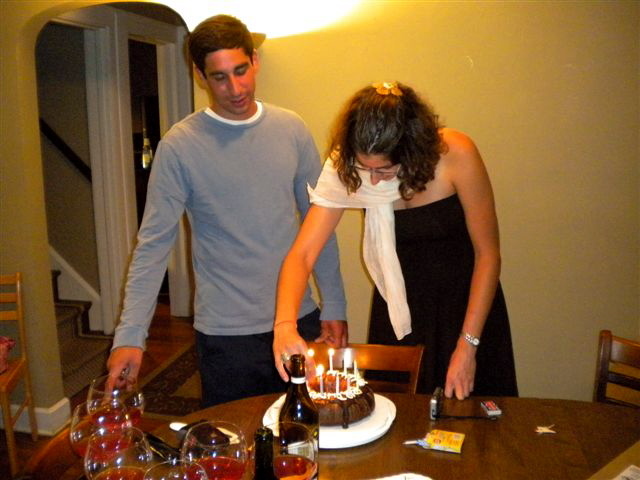 Last year when little brother turned 23, I fondly remembered my 23rd, in that faraway Raleigh lifetime. So, Last Monday my mom texted me (yes, she’s an expert texter!) asking to keep Wednesday open for birthday festivities. I, naturally, responded with “OK, want me to bake a cake?” Because 1. I have no money to buy birthday presents and 2. Baking is my middle name. Yes, she said. Problem. My brother is not a big fan of sweets. (OK, this causes more problems than just the birthday cake one, because I can’t feed him things that come out of my kitchen.) But he does love chocolate. He also loves good, dark beer. So when I found a chocolate stout cake on Smitten Kitchen, I knew I’d hit the jackpot. 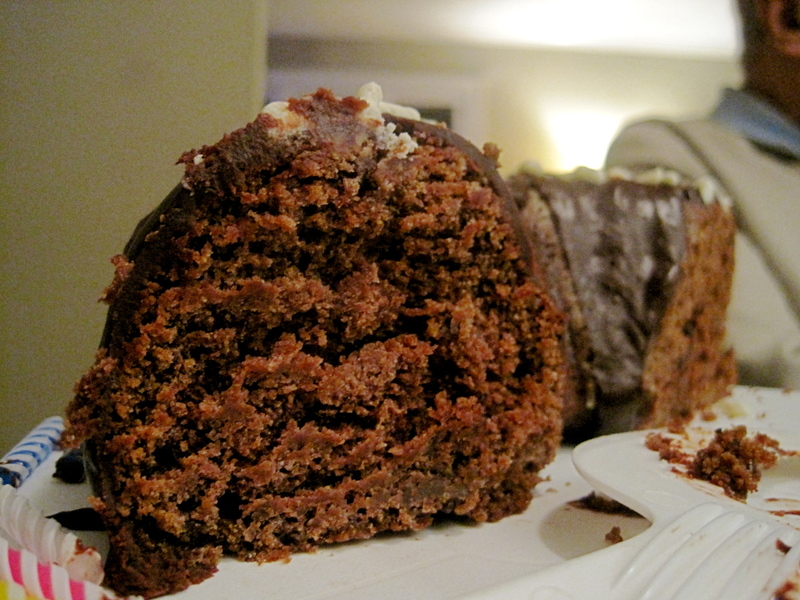 This cake is rich and flavorful, but not so much that you feel sick after one piece. It’s moist and stays moist through the next day. And it doesn’t require any crazy ingredients.